New Delhi: Unsparing on the under-performing shooters but equally scathing on coaches and the national federation, the Abhinav Bindra-led NRAI review committee hardly minced words as it chastised the Rio Olympics flop show while recommending a systematic overhaul. The four-member committee, which had former Asian Games gold-medallist tennis player Manisha Malhotra as convener, has come out with a damning 36-page report reviewing the performance. The committee concluded that the consistent trickle of shooting medals since the 2004 Athens Games ended up making everyone involved in the sport complacent. "Everyone took it for granted that there would be progress automatically, and forgot to ensure a systematic healthy process," the report stated. "To sum up the deliberations of the committee it can be said with no reservations that Indian Shooting 'over achieved' at the Rio Olympic Games. The formula for success was wrong and Indian Shooting had ridden its luck over the last few years, no doubt helped by some extremely talented shooters," it added. The committee was formed after none of the 12 Olympic-qualified Indian shooters managed to get a medal in Rio with Bindra's fourth-place finish in 10m Air Rifle event being the best show. "The committee was unanimous in its view that Indian shooting needs to change, change its attitude, its policies and practices, so that the booming talent gets a fair chance to flourish in a healthy atmosphere, and win all the medals that it can in the World Championships and the Olympics. "The 'chalta hai' attitude that shadows Indian sport has to be stopped. The NRAI has to shed excess flab and needs to become a lean and mean fighting machine to ensure the implementation of a system that will churn out Champions. At present the system is adhoc. There is no systemic framework in place," the committee pointed out. The review report went on to dwell on individual performances, pointing out the laxities that ended up derailing a campaign that was built as India's best medal hope in Rio. From seniors such as Gagan Narang and Heena Sidhu to the rising Ayonika Paul, none of the shooters could escape criticism. The committee called on Sidhu, who has been criticised for making husband Ronak Pandit her personal coach, to take "some tough calls" on her events. "Maybe she should use the training year (2017) to judge whether the 25m sports pistol actually complements her favourite 10m air pistol. Clearly, there has been complication of matters and she essentially needs to get back to the simple aspects of shooting. There was no collaboration with the national coach Pavel Smirnov, which did not help the situation," the committee stated. About Paul, who was found to have misled the Sports Ministry on who exactly was coaching her to garner more funds, the panel felt the rifle shooter was a classic case of a promising youngster being "ill-equipped" to chart her own path. "There were two coaches working with her, Thomas Farnik and Suma Shirur...The Committee feels that Paul's approach to the Olympics shows the flip side of allowing athletes, especially young ones, the power to chalk their own course. They are clearly not equipped or mentally ready to shoulder the responsibility. "The projection of Thomas Farnik as the coach and Suma Shirur only as a mentor, was purely for financial gains. The records and documents presented to the committee proved that Suma was the full time coach. There has to be absolute honesty of effort while preparing for the Olympics," the report stated in its assessment. On the very promising Jitu Rai not living upto expectations, the committee said the pistol shooter did not get the right expertise and could not develop a "working relationship" with foreign coach Pavel Smirnov. Smirnov was also criticised for not being able to work out a plan for Prakash Nanjappa. "The committee feels that the foreign coach Pavel Smirnov did not have the expertise in the precision events to help Jitu Rai win an Olympic medal. Rai's admission of his inability to find a working relationship with Smirnov further put the shooter in a precarious position of coming up with his own training plans. "The lack of expertise for the best shooter in India despite no dearth of support from the Army and the government further highlights the lack of proper planning. His extraordinary talent was taken for granted to deliver an Olympic medal. Any level of talent is irrelevant without correct preparation for the Olympics," it said. 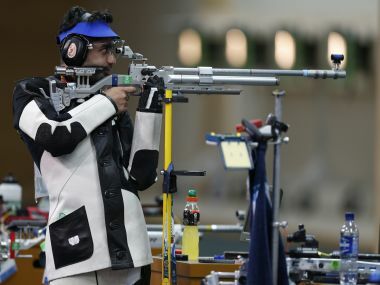 The committee was, however, quite critical of Narang, who had won a bronze medal in the 2012 London Games, and said that the rifle marksman carried a heel injury into the Games and did not stick to the training plan for him. "Coach Stanislas Lapidus was very clear that his training schedule was not followed by Narang, which was informed many times to the NRAI. However, no action was taken. The issue of fitness was ignored and the NRAI was in the dark about Narang carrying a heel injury into the Olympics. "Proven athletes who have the means provided to them must be closely monitored to ensure that training plans are diligently followed. The NRAI must be in constant touch with the expert to have a clear picture of their training phase. It was a clear case of an athlete not being ready to take the load of three events. The lack of monitoring and coordination between all the stakeholders clearly caused the NRAI to take an ill-informed decision." Another shooter who was criticised strongly by the committee was Apurvi Chandela (rifle). "The Committee feels that the claims of coach Lapidus about the struggle to get funds for training are misleading. Apurvi's case was one of the first to be approved in the TOPS scheme. However, funds could not be released until Apurvi submitted a training plan and schedule," the report stated. "The lack of experience and monitoring caused Apurvi to have an accidental injury during her cryotherapy session. It must be noted that all cutting edge scientific training must be under the guidance of suitable experts, which was obviously lacking. The committee also feels that lack of sleep or disturbances on the eve of competition should have been visualised and the athlete could have been protected, or better prepared." Blaming Bindra's fourth-place finish on the luck factor, the committee noted that, "It was good closure of a brilliant career, even though it lacked the fairytale finish." "A classic example of resources, planning and expertise can be best utilised with sincerity, despite all the physical troubles that he had to counter on a regular basis. It also must be stated that the best planning, preparation cannot script the ideal result.